Happy Friday! I'm so excited for the long weekend. If anyone needs me I will be poolside all weekend long! Today's look is one of my favorites. This backpack makes me feel like a modern day Dora the Explorer! I am so in love with it because it can be worn as a handbag and a backpack. I will definitely be using it for all my travels. Backpacks are super trendy and to think I hated backpacks back when I was in school. I always use to opted for a side bag for my books because I truly hated wearing one. Nowadays with the backpack trend going on, I'm loving all these chic styles. It paired well with this off the shoulder top and denim skirt. I really love the details on this top and my oh so favorite, off the shoulder style. 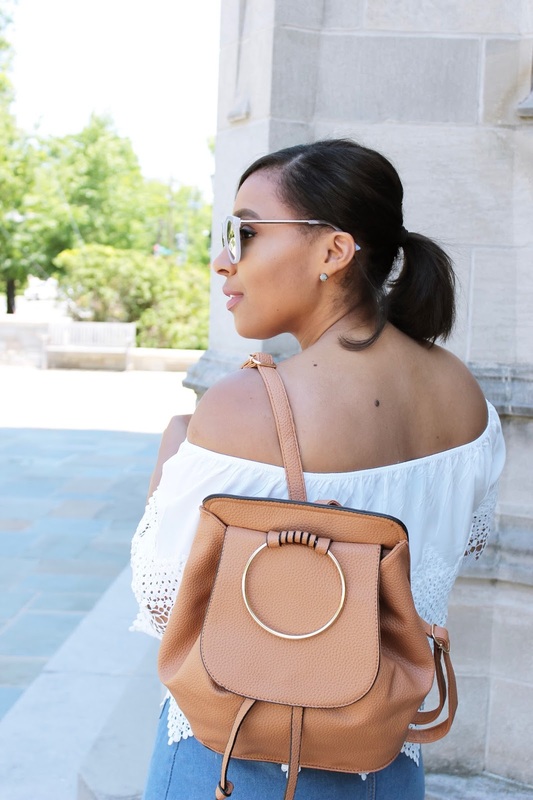 I definitely have to wear more sunblock on my shoulders if I'm going to continue wearing off the shoulder styles this summer. I'm starting to get crazy tan lines on my arms and it's driving me crazy! lol I'm going to try an even them out in the pool this weekend. What are your Fourth of July plans? Like I said, I will be poolside all weekend long lol. Have a great weekend loves! I loved the top and the backpack Patty! perfect for the long weekend! I told you on instagram ... I LOOOOOVE this bag!!! so cute and it goes perfect with any outfit! Thank you I'm obsessed with it! That is why selling advertising campaigns marketing so that you could invaluable explore previous advertisment Quite simply to jot down stronger set that fit this description .